Royal Red (buddleja davidii 'royal red') This old fashioned variety (from 1928) is still a popular hybrid today. Although the name suggest that the blooms are red, they are actually dark fuschia in color. Regardless, Royal Red still puts on an outstanding show of fragrant and colorful blooms in the summer and fall months. 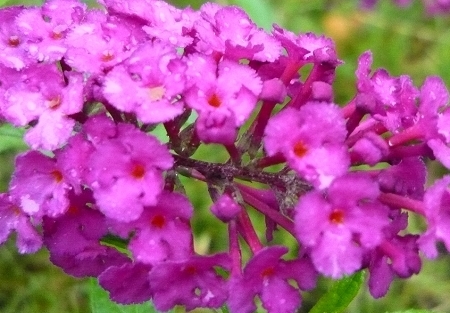 Like most buddleja varieties, it is an easy to grow perennial and quite drought tolerant once established. 6' x 6'. Perennial zones 5-9 Live plant in 3 inch container.